Faith For All Nations started as a nonprofit, multicultural, interdenominational Christian organization operated by volunteers from different ministries and denominations. It was founded by William Giovanni Hurtado, who as a young Evangelist had a commission to bring Jesus to the lives of the people living in underprivileged areas of New York. His ministry was activated as an effort to provide Bibles and Christian literature to the disadvantaged, including immigrants working as day laborers in the area of New York City. After giving his life to Christ more than three decades ago, Pastor Gio has had a desire and passion to serve the Lord in the present generation, by empowering people to take their position In Christ. This desire has led him to serve as a Youth Pastor in several churches and travel as an itinerant minister in the United States and other nations, going under the direction of Holy Spirit, with great power, doing good and healing all who are oppressed, according to Acts 10:38. Pastor Gio graduated in the United States from Rhema Bible College in 2007, and Rhema Pastoral Ministry School in 2008. During those years he served in different areas of the local church at Rhema, Tulsa, Oklahoma. Pastor Favi, also graduated from Rhema Bible College in 2009, and Rhema Missions School in 2010. They were given the privilege of serving and being trained, as Healing Technicians at the Rhema Prayer and Healing Center, 2008-2011. 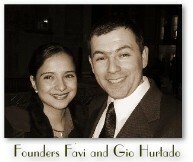 In 2012, by instructions of the Holy Spirit, Pastor William Giovanni Hurtado founded Faith For All Nations Church in Miami, FL (Faith For All Nations Ministries, Inc.) Since then, Pastor Gio has served as the Senior Pastor along with his wife, Pastor Faviola Hurtado, and his two children Alexander and Sophia. Faith For All Nations Church was birthed as a missionary church. In the past two years, it has been developing and growing as a local church, serving and bringing Jesus to our community. However, local demands do not take the focus away from the missionary call. Besides pastoring, Pastor Gio continues to travel as an itinerant minister, to bless the body of Christ, churches, Bible schools, and communities of businessmen.